09:00. It is raining heavily. The forcast looks like being correct for the whole day. We can confirm that Jenny has changed her "magic rain-repellant ganzie" which explains the weather. Everyone is prepared to be soaked through today but an archaeological dig is rather like the golf course where it never actually rains.Jim & Jo of course are used to this and consider it to be anormal archaeological digging weather. Three new additions to our voluntary team members this morning. Welcome to Jessica Kemp amd Katy Cardownie of Newcastle and to Ivan Sharplin. The JCB is busy digging a north-south extension to Trench A in an attempt to determine a southern boundary for the cemetery. It is already known that it does not extend as far as 30m from the southern edge of Trench A. 0930: The JCB has opened Trench A with an extension which is about 2m wide and 5m long. It has uncovered some bone without too much damage. The rest of the work will be completed by hand. Despite the rain pouring down the diggers are soon hard at work in the new trench. 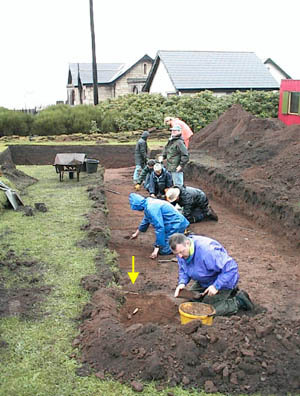 Trench A Extension: The arrow indicates the position where a new skeleton has been exposed. Trench A and Extension looking south. Trench D is 30m away from the southern edge of Trench A. The empty graves of skeletons C5 and C6 are marked. Removal of skeleton C5 did indeed reveal another skeleton beneath it which can just be seen within the impression of the grave. The electrical cable (arrowed) continues through the extension. In the distance the JCB can be seen re-filling Trench E which had the circular water feature. St Mary's Church and the Vicarage are visible through the mist. 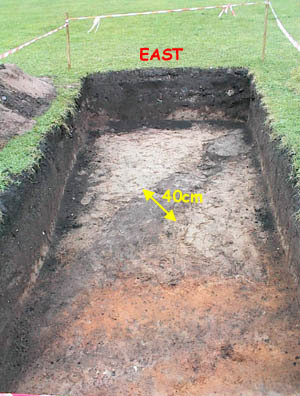 The signifiance of the ditch found in Trench C isn't known at this stage. Although it is thought to be old no pottery or artifacts were found in the ditch to assist in estimating it's age. One possibility is that It could mark some kind of village boundary. 1030. The JCB opened up a new trench (F) some 60cm deep and about 20m east of Trench A for the purpose of defining a boundary to the cemetery. No skeletons or features were revealed and on the basis of this it would seem that any defining to the cemetery is closer than 20m to the east side of trench A. There is still no explanation as to why there is an absence of skeletons within the central part of Trench A which is clear from the updated version of the layout of skeletons in the trench. 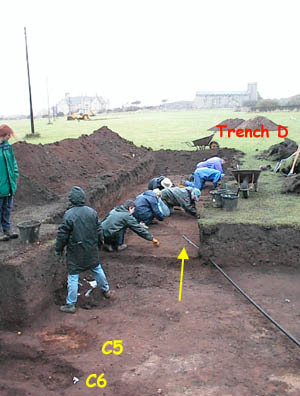 Trench A. Layout of skeletons found by Day 7. 16:15. The rain stopped before lunch and it is dull but not raining now. In Trench AX (Xtension of A) several new skeletons have been revealed though most still require a lot careful trowelling and brushing. 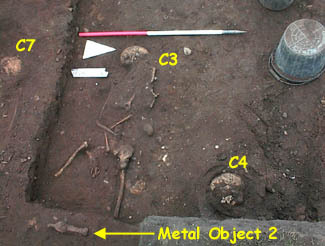 Skeleton C7, which is just inside the new extension, can be seen in the picture below. Trench A. skeletons C3 and C4 are marked. to the location of the first two. The spear-shaped metal object, found in the south-east corner of Trench A, appears to be very similar to the new discovery. We await with interest the removal of the new object. Tomorrow the BBc TV team from "Meet the Ancestors" will be recording on-site.